BRADFORD, UK (February 18, 2013) – GIK Acoustics-Europe announces a breakthrough option to our line of absorption products – the new, built-in Scatter Plate. 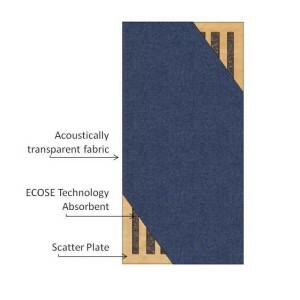 Customers can add scattering / diffusion to all our broadband bass traps and acoustic panels by selecting the Scatter Plate, which is a wooden plate crafted with a mathematical sequence of slots that add one-dimensional scattering / diffusion. The Scatter Plate is built-in between the fabric and the absorption material on GIK Acoustics’ 242 Acoustic Panel, 244 Bass Trap, Monster Bass Trap, Tri-Trap Corner Bass Trap or ArtPanel. The concept of the Scatter Plate follows that of professionally designed control rooms which utilize wooden slats along the walls in front of broadband absorption to give an even balance of absorption, diffusion, and scattering. GIK Acoustics-Europe’s broadband bass traps and acoustic panels offer great performance with an attractive price, and when coupled with diffusion and scattering can give your room a completely balanced sound without over-dampening high frequencies. The GIK Acoustics Scatter Plate sequence prevents periodicity, while giving great scattering from 2.5 kHz up to and above 10 kHz. The Scatter Plate option is available as a built-in addition for only £35.00 Exc VAT/£42.00 Inc VAT per panel. With thousands of GIK Acoustics bass traps, acoustic panels and diffusors installed around the world and with locations in the U.S. and Europe, it is clear that GIK Acoustics is the #1 choice for recording studios, listening rooms, home theatres, churches, and live auditoriums. Since 2008 GIK Acoustics-Europe has provided the largest selection of highest quality products at affordable prices as well as providing clients with a professional design and support staff to achieve a quality acoustic space. This entry was posted in Press and tagged diffusion, diffusor, room acoustics, room setup, scatter plate.